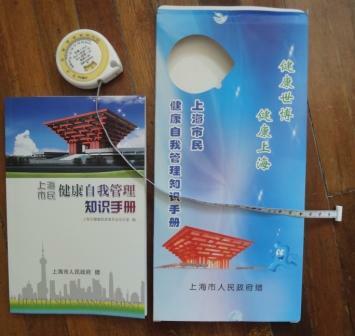 The title of the book is “Shanghai Residents Guidebook to Self-Managed Fitness” [thanks, SLS], and if it’s not obvious, the device in the upper left-hand corner is a tape measure with a Body-Mass Index [BMI] calculator built into it. The BMI is a handy short-hand for assessing whether or not someone is obese (or underweight); meanwhile, waist circumference is a good way of assessing a person’s risk for diabetes, heart disease, and other weight-associated diseases. So, below, note the green and red zones on the tape, as well as that easy-to-use BMI spin wheel. Government paternalism [fraternalism?] at its best. Cry for Help: I’d love to know how widespread this mailing was. If you live in Shanghai, and received one, could you let me know in the comments or via an email? Addendum: Back in January, Beijing, always less subtle than its Shanghai cousin, skipped the mail slot and instead sent the BMI tape measures home with school kids, telling them to assess mom and dad, then report back. I sat next to a fever on my flight into Shanghai. Chinese authorities have been conducting temperature checks on incoming international flights for almost two months now. So last night, when I boarded a Shanghai-bound flight in Tokyo, I wasn’t in the least bit surprised to be informed that the plane’s arrival would be delayed for a few minutes by a temperature check of all passengers. It goes something like this: the flight lands, taxis, and stops at the gate. Along the way, passengers are told to remain in their seats and not . A moment or two later, in a scene reminiscent of the opening moments of Star Wars (when stormtroopers burst into the rebel craft, firing lasers, followed by Darth Vader), teams in biohazard suits emerge at the front of the plane, and work the aisles, firing laser thermometers at the foreheads of seated passengers. So what happens when this very efficient, mostly innocuous process finds a fever? Full disclosure: I did not gargle. As it happens, attendance at this conference was negatively impacted by the H1N1 scare, and so I suppose it’s understandable that the organizers would want to reassure their still sizable number of attendees (roughly 300, I’m told). 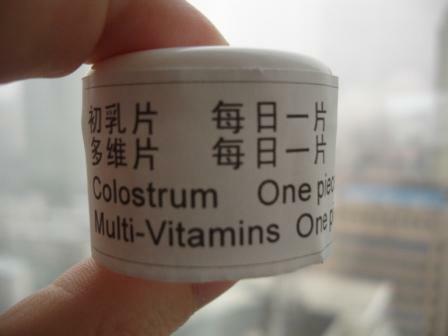 Whether vitamins will make a difference – I’ll leave that to the physicians. Anyway, I post this item as a curiosity, but also as a contrast to my experiences in China during the SARS epidemic of 2003. Then, unlike now, the government was heavily criticized (and rightly so) for its delayed, anemic response to a very real health crisis, and its subsequent effort cover it up (the epidemic, and the anemic response, that is). The response to H1N1 couldn’t be much different, and for those who find the H1N1 objectionable/too cautious/ridiculous, I humbly suggest that it can’t be fully appreciated (much less, writtenabout) without the context of what happened in 2003. Mistakes were made, and now – for better or worse – they’re being avoided, and perhaps (it seems obvious to me, at least), over-compensated for. Shanghai to Mexican passport holders: tortillas are for losers. “When first moved to the hotels, some Mexican people said they preferred delicious Chinese food and now they say they miss Western food. We will meet all such dining requests raised by the quarantined people,” Xu told a press conference. Me, I’m under a deadline-inspired quarantine, and so even though I won’t be blogging for the next 48 hours, I plan to find the time to go out for some delicious Mexican food in solidarity with the detained Mexican passport holders.